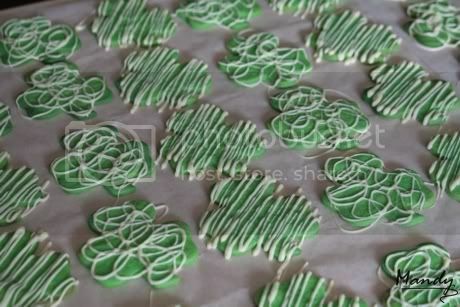 Green Clover Sugar Cookies — What the Fruitcake?! 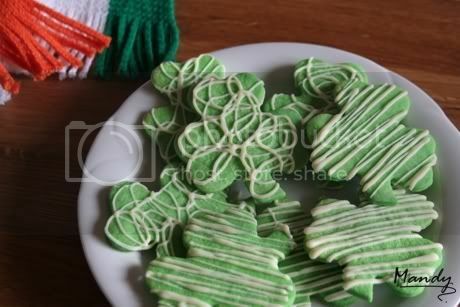 I have been looking for a fun cookie to make for St Paddy's day as this is my first one in Ireland, and as I've mentioned somewhere, I'm always looking for an excuse to bake. 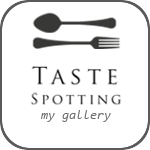 They looked and tasted great, two very important attributes! I use Nestlé Milkybar which I find to be extra creamy. You can also colour the chocolate for something a little bit more different. These cookies are great for any occasion 'cause you could colour them any colour you like and try out different shapes. Blue or pink for a baby shower could be lots of fun! In a seperate bowl, place butter and sugar and beat until light in colour. Add the food colouring, egg and milk to the butter mixture and beat until combined. With mixer on low speed, slowly add flour. Divide the dough in half, wrap in clingfilm or wax paper and refrigerate for 2 hours (or leave overnight) I find it helps to shape the dough into thick discs as it makes rolling it out a bit easier. 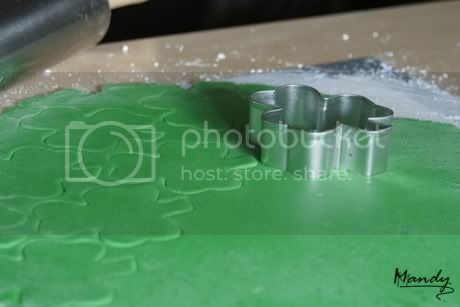 Sprinkle work surface and rolling pin with confectioner's sugar and roll out dough to about ¼ inch (about ½ a cm) thick. Move dough frequently to prevent it from sticking and add more confectioner's sugar to work surface and rolling pin as needed. Cut out shapes and re-roll dough as needed. Try keep the dough as cold as possible, it's easier to work with and doesn't stick as much. I alternate between the 2 halves of dough ie. after I've cut out and removed shapes from the one lot, I knead together and wrap the leftover and put it back in the fridge/freezer while I use the other half, etc. Place cookies about 1 inch apart on parchment-lined baking sheets and bake until cookies are set but not brown, about 7-8 minutes. Let cookies cool on the pan slightly before transferring to a rack to cool completely. Once cookies are completely cool, line them up on wax paper. Melt the chocolate in a double boiler or microwave (be careful not to burn the chocolate if using a microwave). I find it easiest to melt the chocolate in a jug so it's easy to pour. Add food colouring if you're using any. Pour melted chocolate to a disposable pastry bag, cut a tiny bit off the tip to make a small opening. Gently squeeze the pastry bag starting at the top and drizzle lines or squiggles etc over the cookie. Allow the chocolate to cool and harden completely before eating or packing into tins. I let them sit out for a good 2-3 hours. Break off any bits of chocolate that are off the edge of the cookie once the chocolate is completely dry. Depending on the size of your cookie cutter, this should make at least 36 cookies. You can roll them a little thinner but bake for less time and you'll need more chocolate to cover them all. 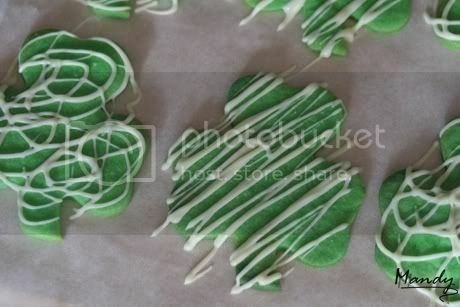 Posted on September 26, 2009 by Mandy Mortimer and filed under Baked, Sweet and tagged Clover Cookie Green Cookie Sugar Cookies White Chocolate.